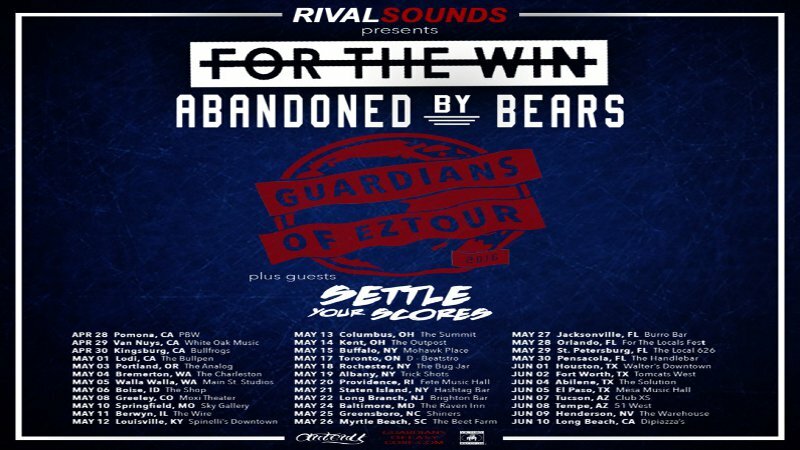 Join Sweden's Abandoned By Bears as they pack up their instruments and hit the US for the first time on the “Guardians Of Easycore Tour.” The scene newcomers will make their debut in Buffalo on May 15 at the Mohawk Place as they share the stage with For The Win, Settle Your Scores, Arrow Trail, So Far So Good, One Less Today and The Last Sentry. The band will release their new album The Years Ahead on April 29. "With shredding riffs, pissy snarls and perhaps as much razor sharp melodies and gang vocals as you can possibly cram into a dozen tracks, The Years Ahead, the latest release from Victory Records’ newest signee Abandoned By Bears, is fun as hell," our album review reads. Read the full review here. "It’s hard to say without sounding cheesy, but it’s amazing how much our fans support us," the band said. "We can't wait to get this going and finally be able to meet some of all the amazing people we've talked to on the internet during these years as a band. They make us proud to be a part of this." The “Guardians Of Easycore Tour” kicks off April 28th in Pomona, CA and treks North across America, hitting the Midwest and East Coast, before circling through the South and closing in San Diego on June 11th. Get your tickets now at www.guardiansofeasycore.com.